When making roasts we often stuff them with fruit to add a nice contrasting flavour. 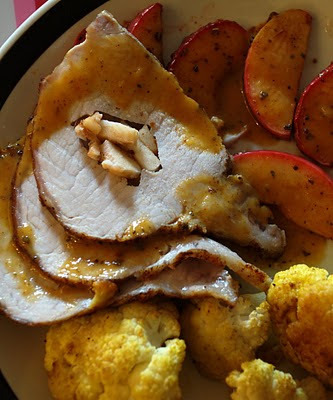 In this case we made a pork roast stuffed with apples. The apples in the centre were still in one piece but the apples closer to the edges turned into delicious apple sauce. We served the roast with sliced apples the were pan roasted with some of the leftover bbq sauce from the ribs we made last week. We then deglazed the pan with orange juice to make sauce that we served on the roast. The roast cooked in a 375 degree oven for about 1 1/2 hours. You can use any fruit like grapes, pears, peaches etc. It adds wonderful flavour to any type of roast.